It’s been a long time since I’ve been this disappointed in a movie. I use that preposition intentionally, because I’m not merely disappointed with this film - I’m disappointed in it, the way I’m disappointed as a high school teacher in my capable but idle students. The movie didn’t quite hurt my feelings, but that hits close to the mark, because despite boasting an abundance of talent and capacity for greatness, La La Land seems content to half-heartedly dance to the sidelines and wave at the great movie musicals rather than join them. La La Land tells a simple story of Hollywood romantics: Mia (Emma Stone), an aspiring actress, and Sebastian (Ryan Gosling), a jazz musician looking to open his own club. After falling for each other despite initial dislike (this being a musical, that’s not much of a spoiler), the two struggle to balance supporting each other and pursuing their own dreams. La La Land begins with a musical number so joyous, so unapologetically goofy and wonderful, that I giggled in my seat. Set on a freeway during a traffic jam, the opening blends the dewey-eyed dream of Hollywood with the frustrating reality of living in Los Angeles. Combining old-fashioned musical tropes, modern dance, and some astounding choreography, this number promises a feel-good musical of old fused with fresh and modern sentiment. When the film’s title appeared, I nearly burst into applause. From there, moments of sheer joy pepper an experience marked too often by hesitancy that, while intentional, comes off as cowardice. A mystifying dearth of musical numbers accompanies a story that stubbornly refuses to let its characters (or us) have too good a time. This movie remains grounded when it should float like Fred Astaire. What’s the concern? Can today’s cynical viewers not handle the unrestrained optimism of classic Hollywood? A speech from John Legend’s character about the nature of jazz and the need for reinvention did nothing for me, as the opening number showed how old and new could have been spun into something better. 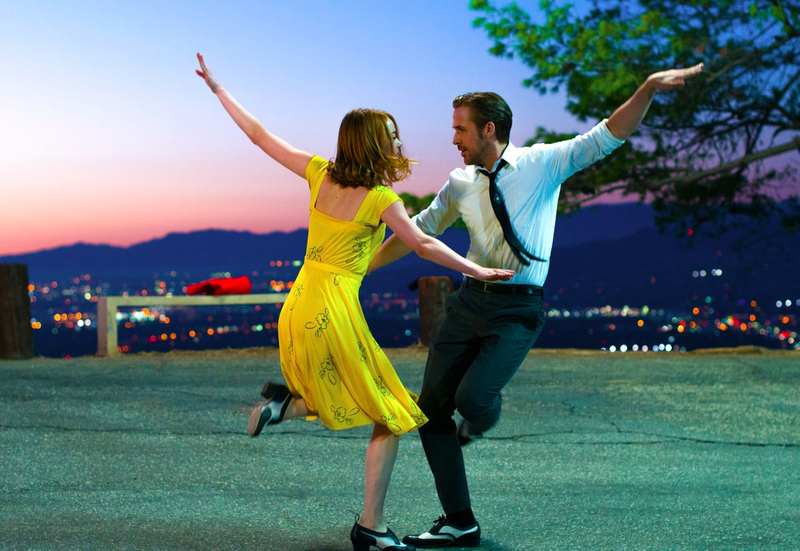 When La La Land leans into the strengths of its genre, we catch glimpses of greatness: a long, unbroken dance against a sunset stands out, as does a gravity-defying scene at a planetarium where their newfound romance literally propels Stone and Gosling into the air. In these moments, we’re freed from the grim reality of the world and transported as only movies can do. At its best, La La Land feels like a glorious return to form, but then the rest of the movie drops, transforming a warm blanket into a damp rag. Were it simply bad, La La Land would sting less, but the vast untapped potential hurts. Writer/Director Damien Chazelle proved himself with Whiplash (2014), an unforgettable examination of perfectionism and emotional abuse which pulsed with energy and suspense. Stone and Gosling have chemistry, and while not known for their singing or dancing, the pair proves capable in those roles. The necessary pieces were all on hand but failed to coalesce into a proper musical, as if the filmmakers saw Singin’ In the Rain years ago but could only vaguely remember what it felt like. The film’s final minutes actually made me angry. The narrative breaks to show an alternate way that the story could have played out (which again, feels like noncommittal cowardice), and these closing moments contain everything the majority of the film lacks. The film’s opening and ending numbers make clear that it could have delivered what we wanted but simply chose not to. La La Land teases the musical we need and then sticks us with the musical we deserve, proving to be just one more way 2016 let us down.